Neither of the teams that faced each other on November 10, 1985 in Philadelphia were doing particularly well as they reached the tenth week of the season. The host Eagles, coached by Marion Campbell, had a 4-5 record after losing at San Francisco the previous week, although they were showing signs of life after a 1-4 start. 34-year-old QB Ron Jaworski operated behind a mediocre offensive line. 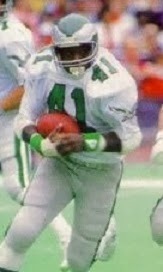 WR Mike Quick (pictured above) was an established star and RB Earnest Jackson, obtained from the Chargers, was a workmanlike runner. 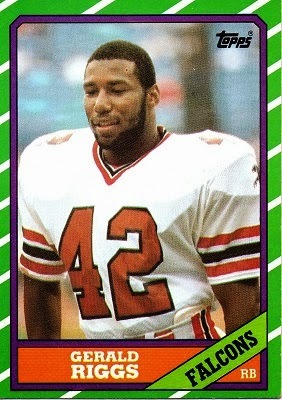 The defense featured DE Reggie White, a newcomer from the USFL who joined the club four weeks into the season, and FS Wes Hopkins. Things were much worse for Head Coach Dan Henning’s Falcons, who were at 1-8. The top performer on offense was RB Gerald Riggs. Long-time QB Steve Bartkowski had been supplanted by David Archer, who was far more mobile but also less talented as a passer. Injuries had affected the defensive backfield and the linebackers were a mediocre unit. There were 63,694 fans in attendance at Veterans Stadium on a sunny and mild afternoon. The Eagles had the first possession and punted. Atlanta drove into Philadelphia territory helped by two third down conversions. QB David Archer ran for 14 yards in a third-and-seven situation and Gerald Riggs picked up 12 yards up the middle on a third-and-two play. However, after reaching the Philadelphia 34, Archer threw a pass that was intercepted by SS Ray Ellis. The Eagles went 54 yards in ten plays that extended into the beginning of the second quarter. Ron Jaworski completed three passes along the way, including one to WR Kenny Jackson for 21 yards in a third-and-eight situation and another to WR Ron Johnson for 10 yards on third-and-eight. That set up an eight-yard touchdown carry by Earnest Jackson and, with Paul McFadden’s extra point, the home team held a 7-0 lead. Following an Atlanta punt, the Eagles started off with Jaworski throwing to Mike Quick for a 39-yard gain, but the drive stalled in Falcons territory and Philadelphia had to punt. 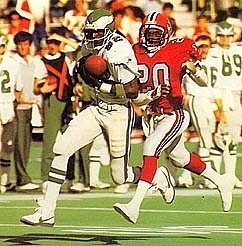 The Eagles got the ball right back when Archer was picked off by CB Herman Edwards. Starting at the Atlanta 40, Jaworski threw to Johnson for 37 yards and, after three runs by Earnest Jackson picked up two yards, Jaworski carried the ball himself on fourth down for a TD. With McFadden’s kick, Philadelphia was up by 14-0. Neither offense was able to get anything going for the remainder of the half. The Falcons punted following their first series of the third quarter and Philadelphia again drove to a score, going 57 yards in 12 plays. Earnest Jackson ran well and Jaworski threw to TE John Spagnola for 12 yards in a third-and-four situation. The drive stalled at the Atlanta 13 but McFadden kicked a 30-yard field goal to extend Philadelphia’s lead to 17-0. The teams traded punts until the Falcons put together an 84-yard series that went into the final period. Archer had two throws to WR Stacey Bailey for 18 yards apiece and Riggs ran effectively. Finally, Archer threw to RB Joe Washington for an 18-yard touchdown and, adding Mick Luckhurst’s PAT, Philadelphia’s lead was cut to ten points. The Eagles went three-and-out on their next series and Atlanta again responded with a scoring drive, this time using 11 plays to go 81 yards. Riggs had six carries for 42 yards and Archer ran twice himself for 19 more yards. The last rush by Riggs was for a one-yard TD and, with Luckhurst’s successful conversion, it was a 17-14 score with 5:30 left in regulation. On the next play from scrimmage, LB John Rade intercepted a Jaworski pass to give the Falcons the ball at the Philadelphia 25. Atlanta largely kept the ball on the ground to get down to the 10 and Luckhurst tied the game with a 27-yard field goal. The Eagles had to punt on their next series and Atlanta drove into Philadelphia territory on a possession highlighted by Archer’s throw to TE Arthur Cox for 30 yards. But with nine seconds remaining, Luckhurst was wide to the left on a 42-yard field goal attempt and the game went into overtime. The Falcons had the ball first in the extra period and were forced to punt, but Rick Donnelly’s 62-yard kick went out of bounds at the Philadelphia one. Jaworski went right to the air, tossing a pass intended for Kenny Jackson that fell incomplete. He went to the air again, and this time he didn’t miss as Quick, running a slant pattern and splitting CB Bobby Butler and SS Scott Case, pulled it in at the 30 yard line and went the distance for a 99-yard touchdown. In stunning fashion at 1:49 into overtime, and after having blown a 17-0 lead, the Eagles came away winners by a score of 23-17. It was the first overtime win in franchise history. The 99-yard touchdown was the longest pass play to decide an overtime game in NFL history and tied the league record that was first set in 1939. Jaworski and Quick became the sixth combination to accomplish the feat (through 2012, seven more had done so). Philadelphia had the edge in total yards (330 to 310) although the Falcons generated more first downs (20 to 15). Atlanta also had 215 rushing yards, but only 94 net passing yards. The Eagles sacked David Archer six times while the Falcons got to Ron Jaworski on three occasions. Each team suffered two turnovers. Ron Jaworski completed just 11 of 30 passes for 258 yards and the one touchdown while tossing two interceptions. Mike Quick, with the long score to win the game, had three catches for 145 yards. Earnest Jackson (pictured at right) paced the ground game with 74 yards on 19 carries that included a TD. DE Reggie White and NT Ken Clarke each accounted for two sacks. For the Falcons, Gerald Riggs rushed for 129 yards and a touchdown on 27 carries. David Archer gained 70 yards on 10 rushing attempts while completing 12 of his 25 throws for 133 yards and a TD and had two intercepted. Stacey Bailey had 5 pass receptions for 51 yards. The Eagles won the next week to briefly rise over .500, but then lost four straight games and finished at 7-9, which placed them fourth in the NFC East. By the end, Coach Campbell was gone – he would resurface as defensive coordinator of the Falcons the next year and would succeed Dan Henning in 1987. Atlanta also came back with a win the following week and ended up with a 4-12 record, putting them at the bottom of the NFC West. Mike Quick caught 73 passes for a NFC-leading 1247 yards (17.1 avg.) and 11 touchdowns. He was a consensus first-team All-NFL selection for the second time and was named to the Pro Bowl for the third straight year. Gerald Riggs led the NFC in rushing with 1719 yards on a league-topping 397 carries (4.3 avg.) and scored 10 TDs. He was chosen to the Pro Bowl for the first of three consecutive years.